A beautiful symbol of spring, there are poppies in gardens everywhere around here at the moment. This painting was inspired by photos of poppies taken in our garden a couple of years ago. I created layers on the canvas with tissue paper, scrapbook papers, acrylic paints, inks, and a honeycomb stencil, then painted the poppies, seed heads, and bumblebees with acrylic paints. The bumblebees were fun to paint. I think they help to add movement and life to the painting. In the language of flowers, the poppy is associated with faith, remembrance, and consolation. The red poppy has come to symbolize the sacrifice of those who laid down their lives during the two world wars. According to folklore, if you sniff a poppy three times a day it will bring you luck. I have yet to test this! At the moment we are in the process of redecorating our living room and I decided it would be nice to have some new art to hang on the walls. 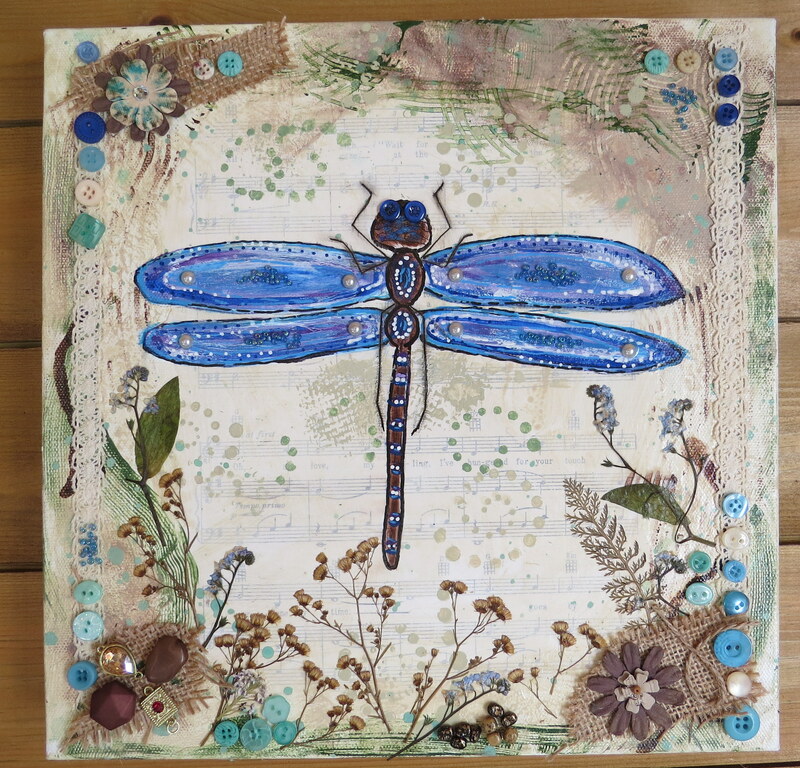 I love dragonflies and had fun creating this mixed media canvas. 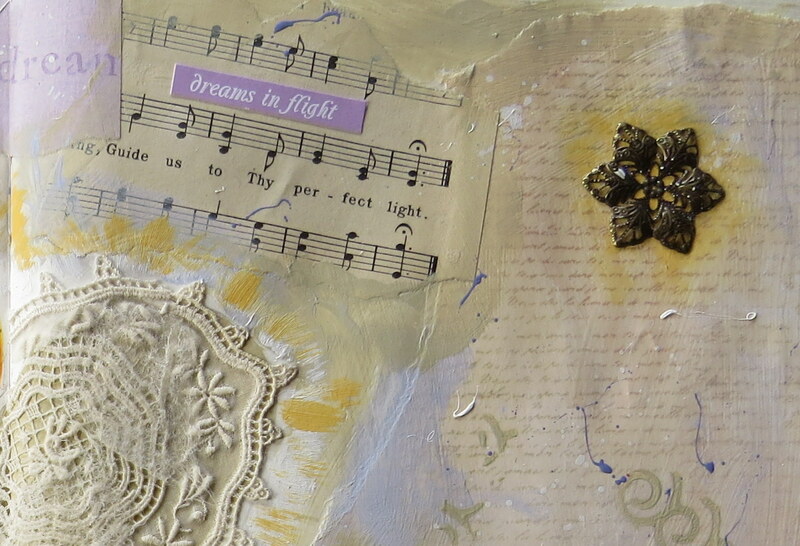 For the background I adhered a page torn from an old book of piano music to the canvas, then used paints, inks, and stencils on top to add marks and texture. Dragonflies, in nature, often have vibrant, jewel-like colours, and the canvas lent itself to lavish embellishing with buttons, lace, and jewels. 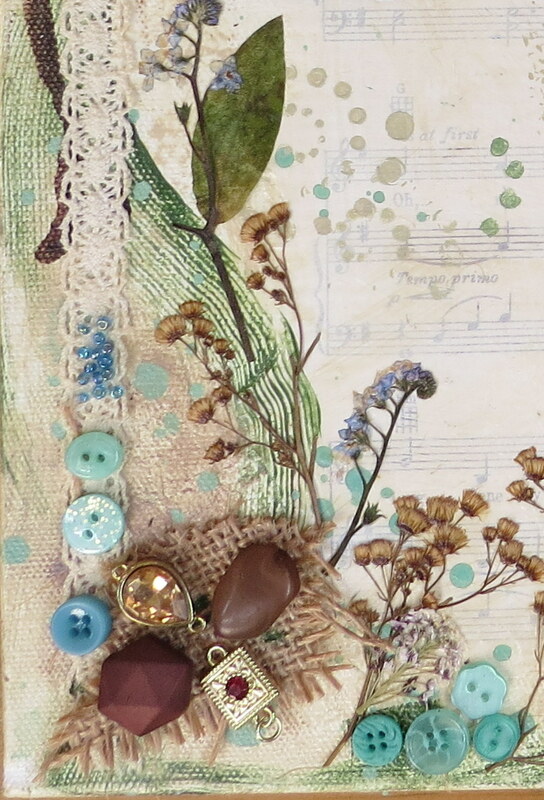 I added natural elements of burlap and pressed flowers, ferns, and leaves. The dragonfly’s wings are adorned with pearls and seed beads to add a little bit of sparkle. May you touch dragonflies and stars, dance with fairies and talk to the moon. 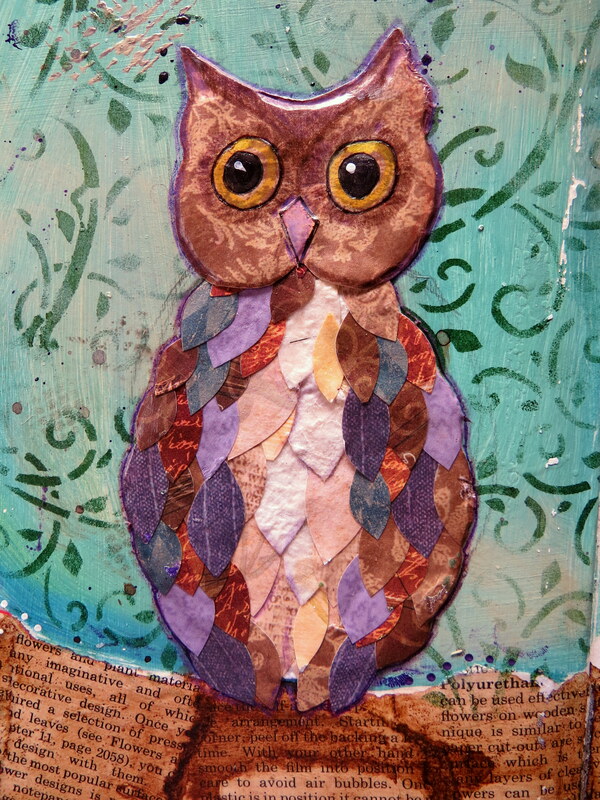 This owl journal page was inspired by a recent Kelly Rae Unscripted video. I love watching Kelly Rae’s weekly painting videos and get lots of ideas for techniques I can incorporate into my own art. First I painted the background, then stenciled on a pattern with ink. 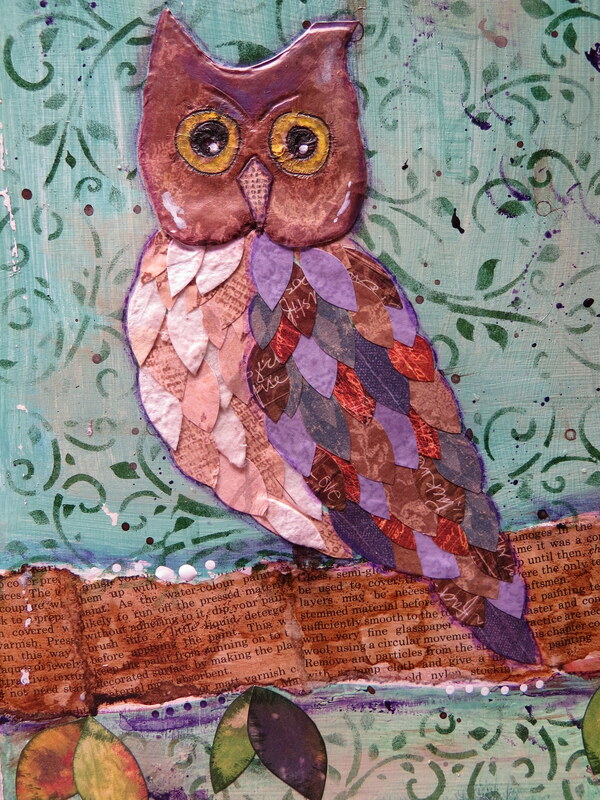 The tree was collaged with pages torn from an old magazine, then painted over with inks and granulation medium. 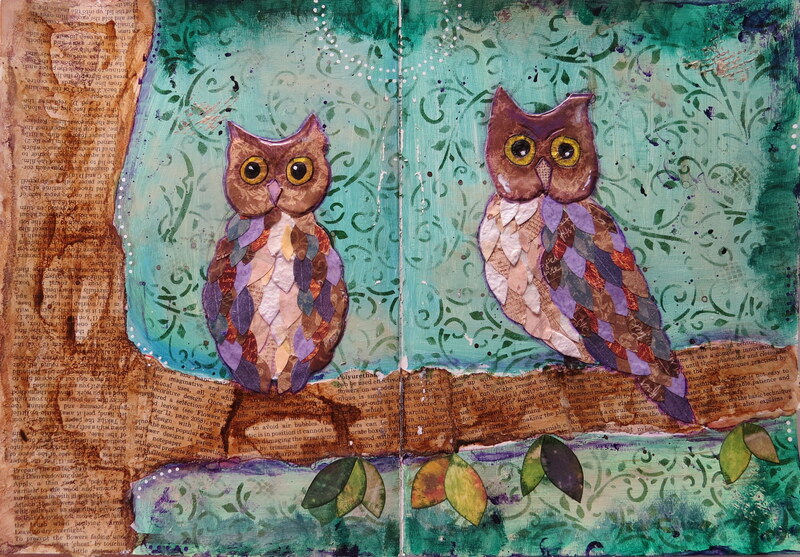 I sketched the owls on to the page, cut out feathers from scrapbook papers and glued them down with Mod Podge. The leaves are cut out from scrapbook papers and outlined with ink. I used coloured pens for outlining, inks for shading, and paint pens for the moon and moonlight. I created this canvas panel using the acrylic photo transfer technique. It is the first time I have attempted this technique. 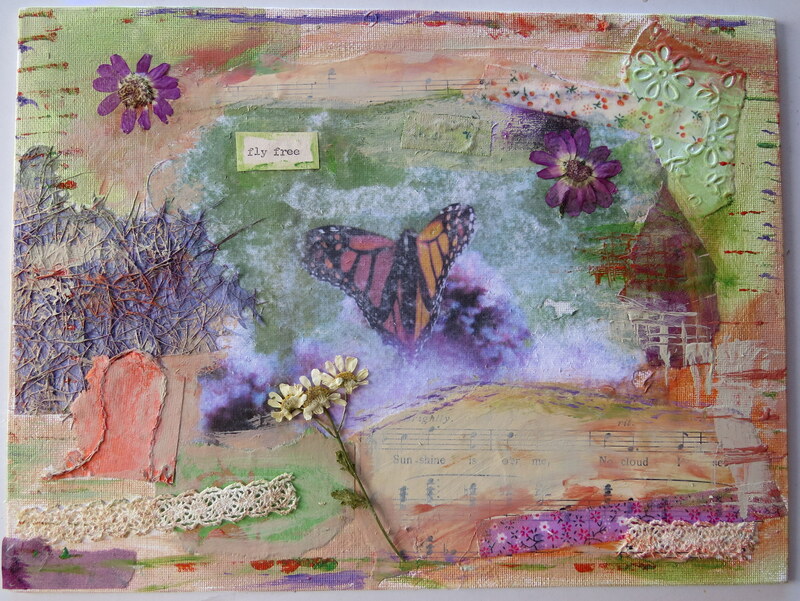 I used a photograph that Nick had taken of a monarch butterfly for the centre image, then added paint and mixed media elements around it. I was quite pleased with how it turned out, but I definitely need some more practice. I rubbed a little too hard and removed some of the image, but I like how it has a dream-like quality. 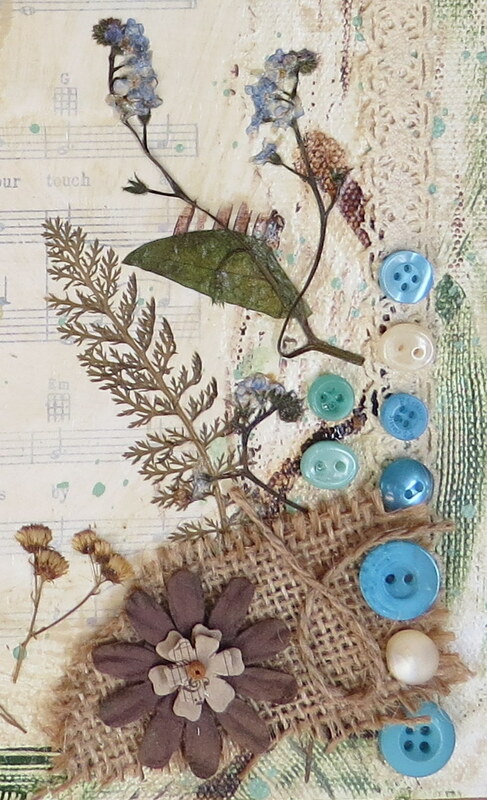 I added a few cineraria and feverfew flowers from my garden to tie in with the nature theme of the piece. Angeline Dunwich, one of the characters in my Wattle Lane novels, is obsessed with angels. Her little home above the shop is full of angel figurines, angel art, and angel collectibles. She makes paper angels to display in the window of Wattle Lane Keepsakes, and she firmly believes that our lives can be touched by angels. In book three, Christmas in Wattle Lane, the reason for her obsession is revealed. I, too, love angels. I love the idea of celestial beings watching over us and guiding us through difficult periods of our lives. When I was young, I used to see an old woman sitting on the end of my bed, knitting. I don’t recall if she ever spoke to me, but I do remember that I wasn’t afraid of her. I like to think that she was my guardian angel watching over me, perhaps an ancestor. 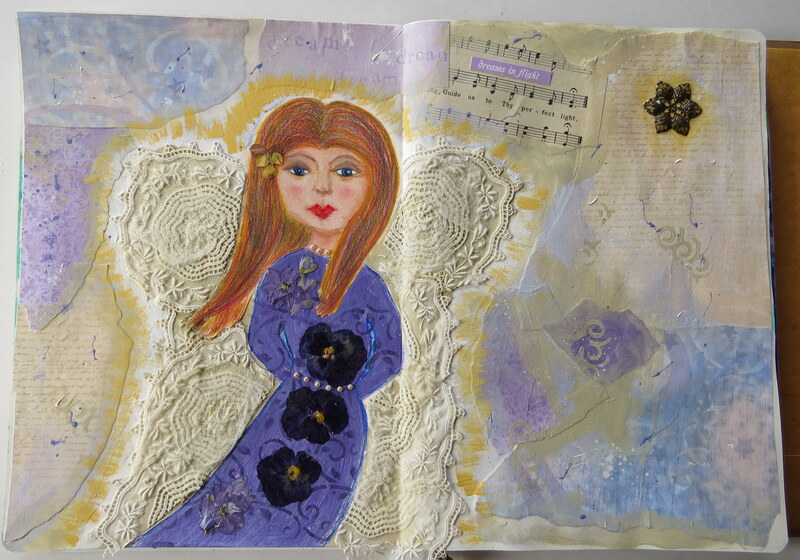 For this art journal spread I used scrapbook papers and acrylic paints for the collaged background, and I added a piece of old sheet music and a metal embellishment. 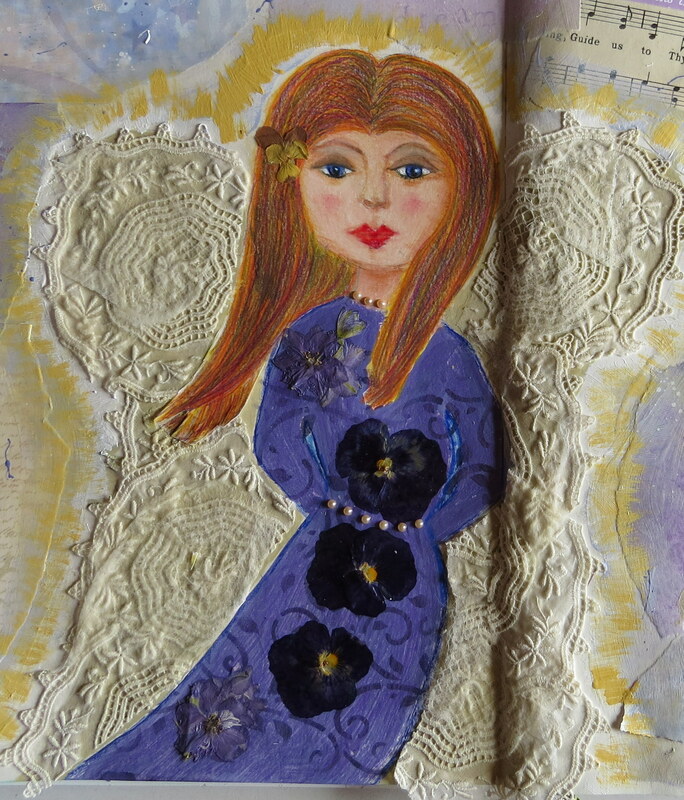 I used coloured pencils and ink for the angel, with pressed flowers and tiny pearls on her dress. 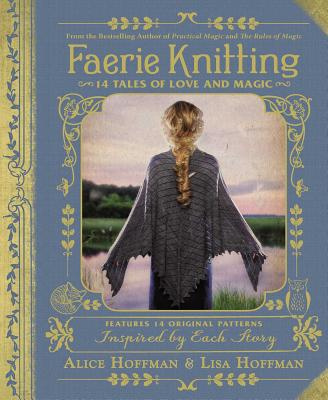 Her wings are made from a vintage lace doily. Here is a close-up view of the details. I love making patchwork. There is something satisfying about cutting up pieces of fabric or paper and joining them back together to make something new. 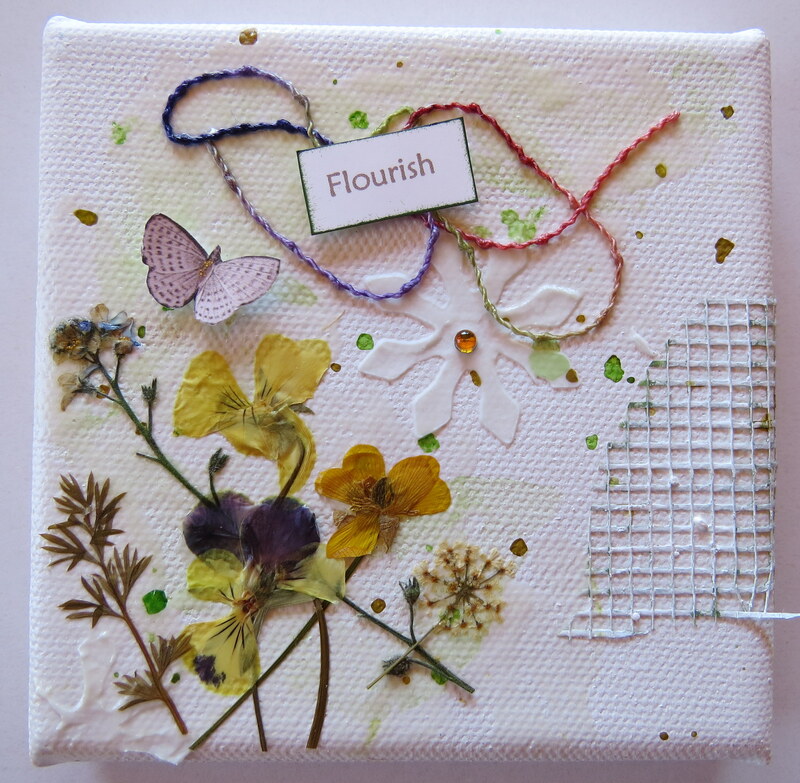 Patchwork quilts fill me with joy, pretty fabrics joined together to make lovely, functional pieces. 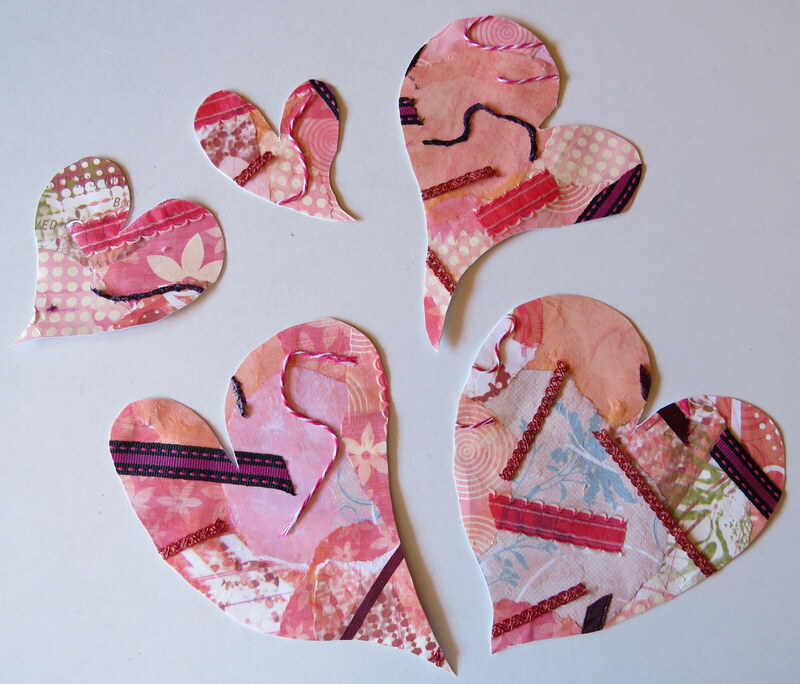 Pretty scrapbook papers fill with me with just as much joy, and collaging these paper hearts was a good way of using up some scraps I had left over from other projects. 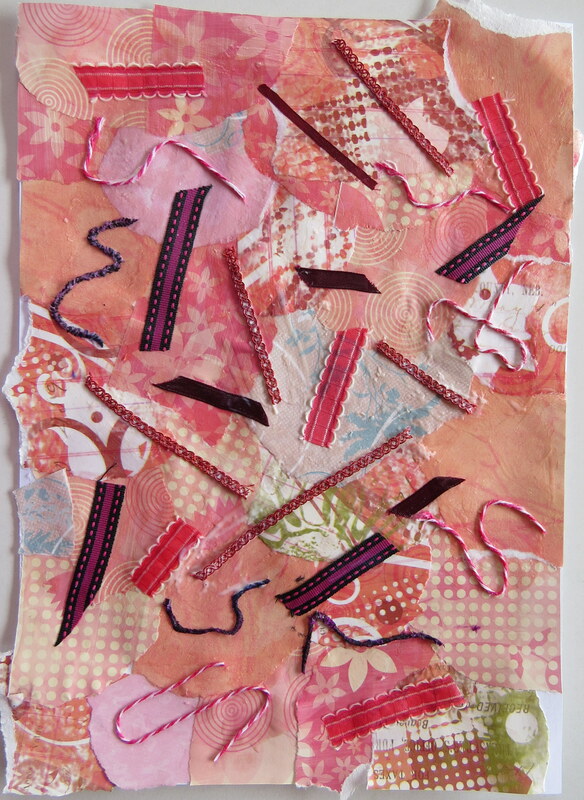 I began by tearing random shapes from the scrapbook papers. 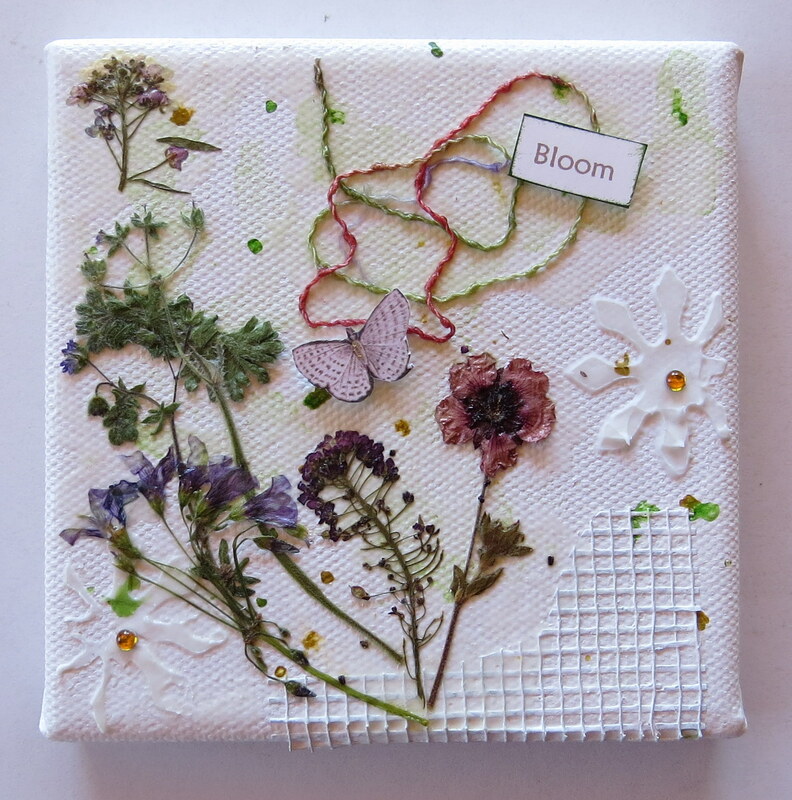 I glued them all onto a sheet of paper with mod podge, then glued little pieces of ribbon and fibres on top. 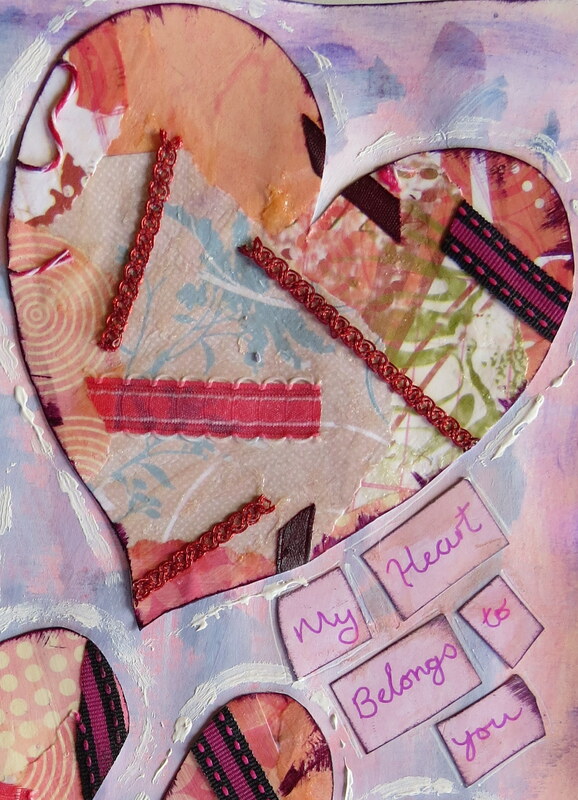 After the glue had dried, I turned the collaged paper over and drew random shaped hearts on the back. 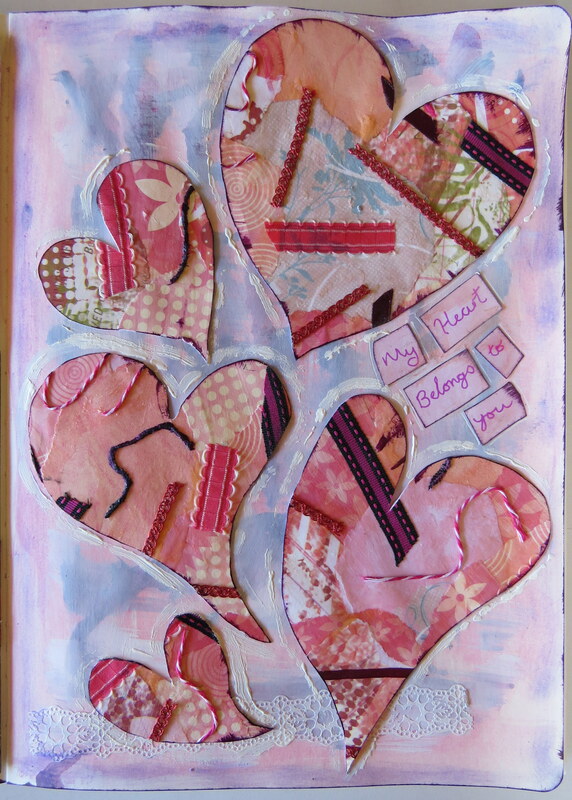 I cut out the hearts and arranged them on a page in my art journal, on which I had already painted a background with watercolour paints and added a strip of paper lace. I wrote sentiments onto paper, cut out the words, inked the edges and added them to my page. 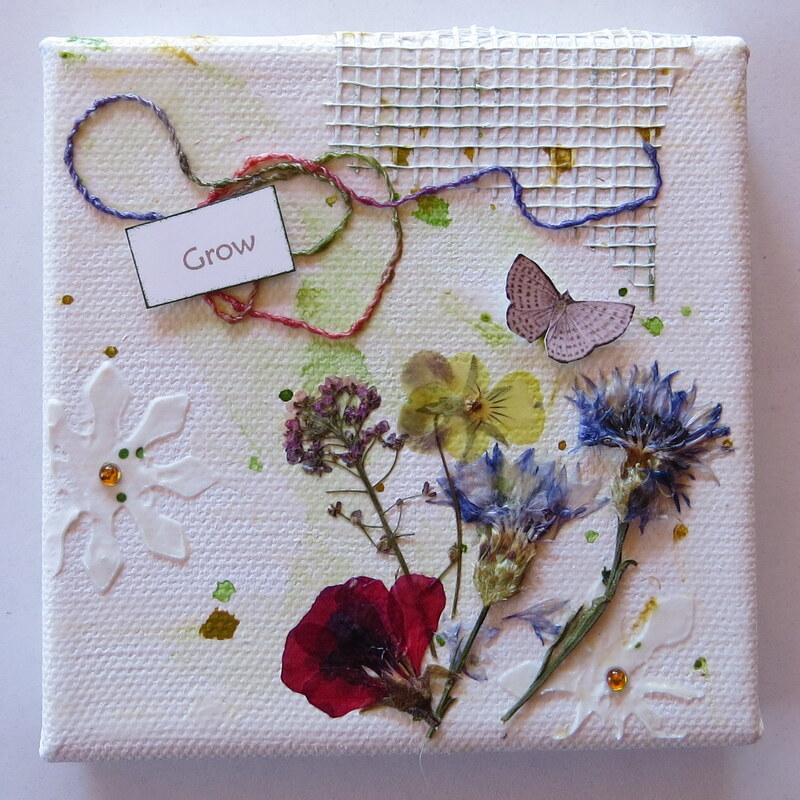 Lately I have been having fun creating mixed-media art on mini canvases that measure just 4 inches square. They have cute little easels to stand them on, too. For this trio, I wanted to create something light and breezy to reflect the beautiful summery weather we are having at the moment. I used watercolour paint, texture paste with a flower stencil, pressed flowers from our garden, butterflies cut from scrapbook paper, plastic mesh, some colourful fibres, and a few sparkly rhinestones for the centers of the stenciled flowers.